A day after authorities revised the timeline of events on the night of the Las Vegas mass shooting, the hotel where the gunman was staying is casting doubt on the changes. Police said earlier this week that they believe Stephen Paddock shot a hotel security guard through the door of his high-rise hotel suite six minutes before he unleashed a barrage of bullets into a crowd at a musical performance below. The injured guard ran down a hall using his radio and possibly a hallway phone to call for help, reporting he had been shot in the leg. That account differs dramatically from the one police gave last week: that Paddock ended his hail of fire on the crowd, where 58 people were killed and hundreds injured, in order to shoot through his door and wound the unarmed guard, Jesus Campos. But late Tuesday, the company that owns the Mandalay Bay hotel casino questioned the new timeline. Las Vegas police did not respond Tuesday night to questions about the hotel's statement or whether investigators stand behind the revised timeline released earlier in the week. The revised timeline raises questions about whether better communication could have allowed officers to respond more quickly and take out the gunman before the attack. It remains unclear if police ever received a call for help from the injured guard. "This changes everything," said Joseph Giacalone, a professor at John Jay College of Criminal Justice and a former New York City police sergeant. "There absolutely was an opportunity in that timeframe that some of this could've been mitigated." Nicole Rapp, whose mother was knocked to the ground at the Route 91 Harvest Festival and trampled by panicked concertgoers as bullets rained from above, said she's "having a hard time wrapping my head around" why police changed the timeline of the shooting. Undersheriff Kevin McMahill said on Tuesday that the guard had been responding to a door alarm on the hotel's 32nd floor when he heard an odd drilling sound. Paddock had power tools and was trying to drill a hole in a wall, perhaps to mount another of the security cameras he set up around him, or to point a rifle through, but he never completed the work, Clark County Sheriff Joe Lombardo said. He also drilled holes and bolted a metal bar to try to prevent the opening of an emergency exit door near his room. Campos reported to hotel security dispatchers that he was shot before Paddock opened fire on the crowd, Assistant Sheriff Tom Roberts told The Los Angeles Times on Tuesday. It wasn't clear exactly what time Campos called for help or if the hotel had relayed the information about the shooting to police. Las Vegas police did not respond to questions from The Associated Press about whether hotel security or anyone else in the hotel called 911 to report the hallway shooting. "Our officers got there as fast as they possibly could and they did what they were trained to do," another Las Vegas assistant sheriff, Todd Fasulo, said Tuesday. The six minutes that transpired between the hallway shooting and the start of the gunman's fusillade wouldn't have been enough time for officers to stop the attack, said Ron Hosko, a former FBI assistant director who has worked on SWAT teams. Rather than rush in without a game plan, police would have been formulating the best response to the barricaded gunman, he said. 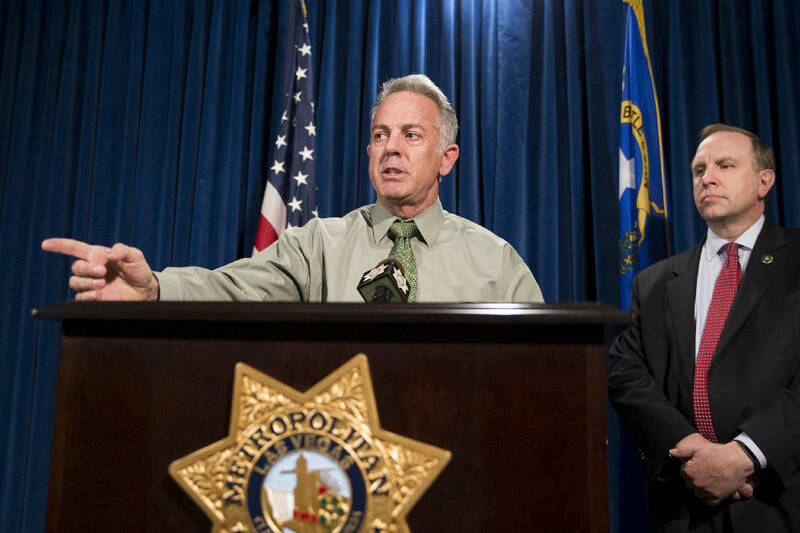 McMahill defended the hotel and said the encounter that night between Paddock and the security guard and maintenance man disrupted the gunman's plans. Paddock fired more than 1,000 bullets and had more than 1,000 rounds left in his room, the undersheriff said.